After the awfulness of the past few days, it’s nice to reflect on pretty much the greatest thing in the world that happened to me when we were in Costa Rica (Costa Rica seems like a distant memory after the hideousness of all the hours spent at Miami International Airport…). On Tuesday afternoon, Rich and I took a stroll down to the beach. We were staying at a crazy beautiful hotel high up on a jungly hill in Santa Teresa, and a stroll to (and from) the beach was a bit of an epic one. It involved walking down pretty much the steepest, rockiest, slipperiest road in the history of the world**. Asphalt hasn’t made it to Central America yet**. As we slipped and slid down the road, I noted a house at 12 o’clock (that’s straight ahead, right?) and by the chain-link fence there was a kennel, and on top of that kennel there was a dog. As we made our approach, he put his head up and seemed to make a silent summons to two other dogs, who appeared (as if by magic) at his side on the kennel. And then, all three dogs were off the kennel, under the fence, and running towards us on the gravel road. 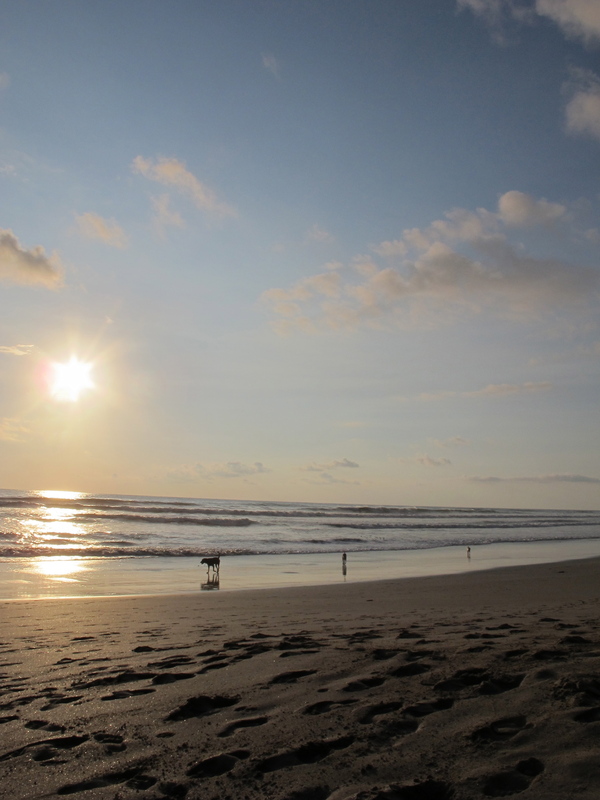 The three pooches sniffed our hands, determined that we were good eggs, and joined us on our stroll to the beach. BLISS! When we got to the beach, I expected to lose sight of our 4-legged friends as they took off in search of old fish bones and remnants of beach barbecues, but no! After a quick run in the surf and a quick sniff of some twigs, they were back at my side. 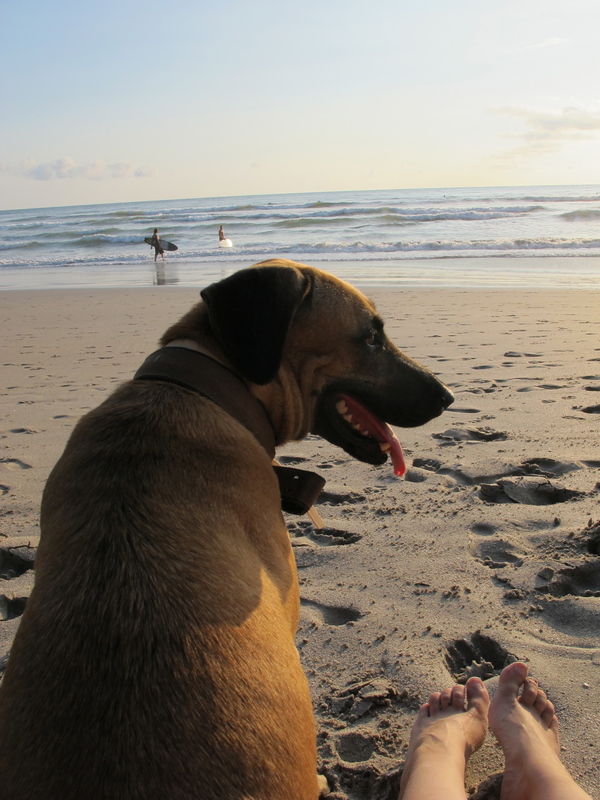 The biggest one (some kind of rottweiler/staffy mutt) leaned up against my leg and stared wistfully out to sea. The littlest one (a scraggly white guy with soft ears) dug a hole in the sand behind my back and curled up in a little sandy nest. The middle-sized one (who looked like Snoopy), sat a metre or so away, gazing along the sandy beach. If any other dogs approached, they would woof and run after them, so no other pooches even had a hope of pats or a leg to lean on. O dogs, how I love thee!! The next day, on a trip back from a big juice and a muffin on the beach, I spied with my little eye… ANOTHER DOG!!! Right near where my gang live!! I wondered if this little pooch was part of their dog gang too. He was a PUPPY! Puppies to me are what young boys are to Kate Ceberano (that song is SO wrong….). Anyhoo, he was digging around in the road, with his over-sized goofy paws, and one of his paws was covered in mud! What a doofus!! It looked like he was wearing a mud-sock. Bless. Speaking of doofus? Well, I think that hat can be passed over to moi after what happened next. As Mud-Paw dug around, I crouched down and called him over. And over he came. Bounding, in fact. I patted his little red head, scratched his floppy ears, and bid him adieu. But he would not take my goodbye for an answer. In fact, he did everything in his puppy power to stop me from leaving. He scraped at my leg, leaving a big dirty paw print on my calf. He jumped up, not once, but about 400 times**, leaving big streaks of mud all over my skirt. He bit at my hand, and my pockets, and my ankles. My love of dogs had suddenly TURNED AGAINST ME!!! Don’t ask me how, but somehow I was able to escape from the demon dog and managed to scramble up the steepest, rockiest road in the world to higher ground/safety. My black skirt was now brown. My legs looked like I’d had an accident with some tanning cream. 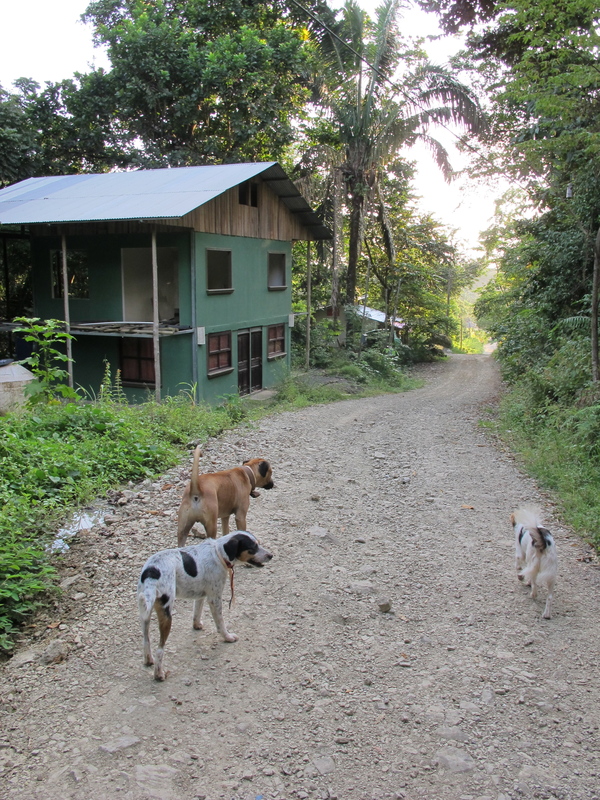 My love of puppies had somewhat soured**…..
Back at our jungle retreat, I washed my skirt, and wondered how I was going to manage for the remainder of our time in Santa Teresa; I did not want to walk back past that dog and risk more muddy clothes and/or loss of limbs from a puppy-toothed mauling, so how would I get to the beach, or to the supermarket, or to the cafe for my morning juice? The following day (aka the fateful day that started with our flight in the 12-seater plane and didn’t end until 56 hours later), our taxi arrived to take us to the airport. We drove past the dog gang house, and Snoopy was back on his kennel, gazing out at the road. O Snoopy… And around the bend, there was the puppy!!! AARRRGGGHHH!!!! He was standing on a slab of concrete, ripping up paper. He was surrounded by a nest of torn shreds, and he happily ripped and tore and chewed and munched as we bumped and rolled past. I said to Rich “There’s that dog!!!! Why I oughta….” while I shook my fist. And I said “Si si, PERRO! !” thinking that I was a great speaker of Espanol. And I whole-heartedly agreed. You crazy dog. 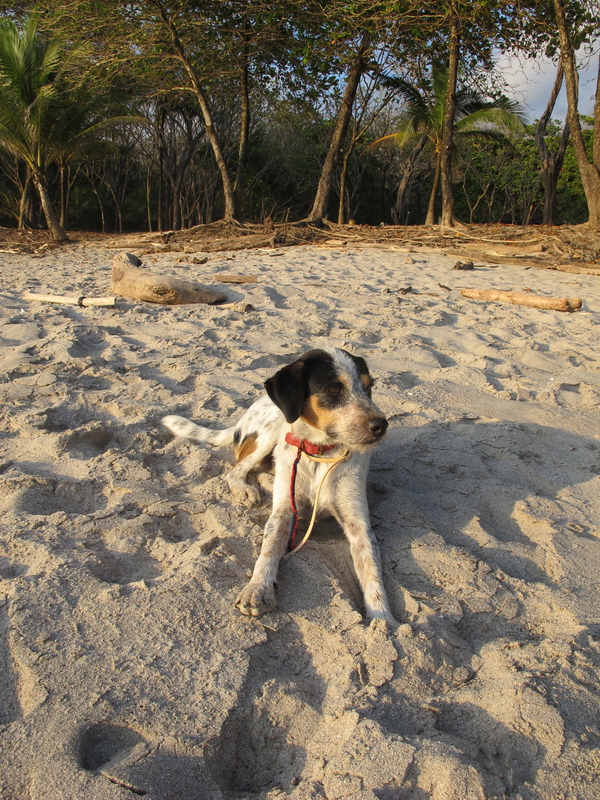 This entry was posted in on the road, world tour and tagged beach, costa rica, dogs, jungle, photography by wembolina. Bookmark the permalink.